New Town Housing Project 1st Phase was launched first time in 1986, this project was purely for locals. Initially, very nominal charges were paid for 500 sq/yd and 1000 sq/yd Residential Plots. Almost more then 50% area at here is populated now and all basic facilities are available, i.e. electricity, drinking water and telephone. Thereafter Phase-II. III, IV-A and Phase IV-B were announced. Phase-II and III is also allotted to locals whereas in Phase-IV, some plot were allotted to the people out side of Balouchistan. It is surprising that these plots were allotted only on the payment of Rs five to ten thousand. This Housing Project works under the supervision of DCO Gwadar. All Record of plots file is available in DCO office Gwadar. AOA u r doing a good job may Allah success you in your field ameen . I need a suggestion to you. I have two files of my name of new town phase 5. One is 5 Marla and one is 8 Marla. When the map of this block is coming and what u suggest that when should I sell these files, when the map will announce or hold for long time. Kindly give me your precious advise I shall be very thankful to you. Jazakallah. I will suggest you to hold it, files are already on your name. It is one of the low budget investment. Its future is good. Thank you for valued feedback, we are trying our best to get the true market picture, but some time we do not get regular rate update from other fellows in the market. We usually check the rates from more than 10 sources in the market to get maximum possible accuracy. It will be updated soon. What is up date Gwadar master plan ? As per CPEC official website Gwadar Master Plan completion is due in April, 2019. New Town files holders who has open files are requested to get transfer these files till 1st April, 2019. New Town will not entertain open files in future. Aua. Mr. Waqar any update in rates?? Price update pending from quite a long time. Thank you for feedback, updated today. Looking forward for your feedback in future as well. i have heard that Gwadar expo is going to held on 28 29 March. 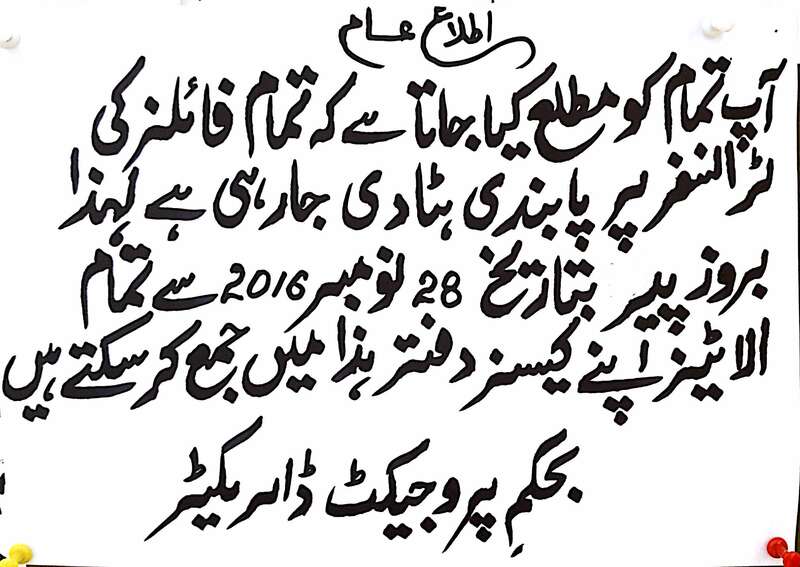 will this event effect the prices of plot price in gwadar? Yes it is will be held on 28, 29 March, 2019. Such event are good for market. Since long, the prices of plots of New Town Gawadar are missing. Your focus is only on Phase-V Extension. Kindly update on the prices of Phase-2 as well. Your earliest response will be highly appreciated. I will ask my team to update other New Town areas as well. As previously i notice prices are going down due to delay in map so what can be sudden cause of incrase? Is map is coming or it comed? I am raling about ph 5 new town. It is due to Saudi Arabia Investment. Buying started in Gwadar Market, but not sure it will sustain or not. Price may come down shortly. why the prices are going up, even though the map and master plan is still pending? Due to News about Saudi Arabia investment. It is going up. Real growth will be witness after ground breaking of New Gwadar International Airport and Gwadar Master Plan. Are you directly dealing with New Town or some other person assigned in your office for New Town and Gwadar. Please provide me the contact details. Also advise the transfer process of New Town if a person is overseas then can he buy file of new town phase 5 commercial file. Please contact Mr. Waqar at +923239581357 for New Town buying & selling. Yes Purchaser can buy without personal presence. New Town Phase 5 is not on ground at the moment. Location of Phase 5 is not officially announced yet. Why plot prices are going down ?? can you please advise which one would be a better option? phase-4 file with map or phase-4 ext./phase-5 file without map? which one have a better scope? Phase 4 with Map on ground location is better choice. and yes, do tell us the summary of this news so as a non proffesional perosn in property what does it actually mean and how it impact? Kindly look at the bottom right corner image for details. ISLAMABAD: The government has made draft of Gwadar Master Plan and envisaged an area of 310.62 square kilometer of land for the utilisation of city development including residential areas. Total planned area envisaged for development purposes stands at 1201.15 square kilometer under Gwadar Master Plan as it has been divided into three main areas including development area, restricted area and remaining other usage of area. For development of city totaling 310.6 sqkm, around 103 square kilometer will be allocated for residential purposes. Out of total area for city development, around 33 percent will be utilised for residential purposes. The remaining area of 890 square kilometer has been divided into both ‘restricted areas’ including 42.77 square kilometer for the purpose of military land on which different facilities will be constructed. After getting approval on this proposed draft plan from the competent forum within next two months period, the existing ban on launching new schemes of real estate will be lifted by the authorities concerned. Currently the Gwadar Development Authority (GDA) had slapped ban for issuance of No Objection Certificate (NOC) till the approval of the Gwadar Master Plan with the purpose that all development of housing societies and others could be aligned in the light of the master plan. According to draft for Gwadar Master Plan which explains that total planning area of the city proposed at 1201.15 square kilometer out of which 25.86 percent or 310.62 square kilometer will be comprised of city development. The remaining land of approximately 890 square kilometer will be treated as ‘restricted area’ including allocated land of 42.77 square kilometer for military. For development of Gwadar city that will be comprised of 310.62 sq.km, the master plan proposed 64.52 square kilometer for the establishment of industrial area, 4.67 sq km for establishment of warehouses and logistics facilities. In a bid to establish Free Zone at Gwadar, the master plan proposed 13.19 sqkm as Gwadar Oil City will also be part of this special economic zone. The business and commercial land under the proposed master plan will stand at 19.2sqkm and there will be 11.86sqkm land to be earmarked for establishing administrative facilities of Gwadar city as it will be made smart city envisaging all latest technologies and infrastructure up to standard of any international city. The Gwadar Master Plan has envisaged allocation of 22.51sqkm for establishment of recreation and entertainment related facilities in the city. For transport purpose, the earmarked area envisaged at 53.07sqkm under this ambitious master plan for Gwadar. The government has proposed earmarking of 11.69sqkm for the purpose of municipal utilities in the city and portion of 6.58sqkm will be planned at ‘white area’ in line with the plan of this document. The vacant land is earmarked to the tune of 344.42sqkm and reserved land 111.21sqkm. Other usage of area included water body to the tune of 65.64sqkm, beach 8.54sqkm and ecological corridor and mountains 317.95sqkm. When contacted top official at Planning Commission for seeking comments, he said that they had prepared more than two drafts of Gwadar Master Plan which would be tabled before the steering committee headed by Minister for Planning within a month period. The different drafts of master plan were prepared because it would have attached cost where the government would have to allocate resources under the Public Sector Development Programme (PSDP) in many years to come for meeting requirements of the city to bring it at par with any developed city of the world. This scribe made efforts to contact officials of Gwadar Development Authority (GDA) on Wednesday including Dr Sajjad Baloch but no one responded till filing of this report. Till date New Town has no officially released any map for New Town Phase 4 Extension & Phase 5 for General Public. I recently a map is available in New Town Office wall. You can only see this map and get picture but they are not giving high resolution image for General Public. May be that is the upcoming map for Phase 4 Ext. and Phase 5 but might not fully approved thats why not offer to public. We should wait for Official Gwadar Master Plan and Official released on New Town Phase 4 Ext. and Phase 5. Overall after launch for New Gwadar Master Plan many things will be clear. Any news for Plots in Newtown phase 4 are cancelled due to litigation issues between Locals and NEwtown administration? Please contact New Town directly regarding this issue. Can you please suggest that i should get a file phase-4 ext. or phase-5 or a confirm plot in phase 4? If you like the New Town and its development you should go for on ground possession plot only. However you may consider Naval Anchorage Gwadar project, it is under development phase and developing as per International standard. Where as New Town development is substandard and general road sizes are 20 feet and 30 feet only. AAWW, would you please guide me about best scheme from 3-4 years investment point of view. which society Naval Anchorage or Gawader Golf City (Pak China Enclave) is better in this perspective? I will suggest you to better go for Naval Anchorage Gwadar. These rates are reflecting own amount or the total price of the plot? New Town has not officially announced any location for Phase 5 yet. why the prices are falling? whats the reason? It is due to Master Plan delay. Dear Atif sab, will you please comment on why New Town and especially its extension properties prices are in continuous downtrend? It is true that delay in Master Plan official publication had affected overall Gwadar properties. It must have some influence on rate of open lands. Here question rises why this had pressed GIEDA, Sangar and New Town schemes rate in minus trend? Why New Town extension experiencing negative sentiments? Kindly elaborate on these issues. Thank you. There are more than one reason, one is delay for Master Plan. For New Town Phase 4 EXT and Phase 5 there are rumors in market about reducing sizes of few categories to meet the land shortage. Also location for Phase 5 is yet not officially announced. Asslam-o- Alykum, Please update new town phase 2 prices. It is come to notice that China require important places of Gwadar on ownership basis that is why delay in approval of master plan moreover china does not wants to include any other country in cpec Is it true ? New Town is Govt. Project and Govt. is responsible for it. Please contact Mr. Waqar at +923239581357 for further assistance. He can help you to buy New Town 200 yards plot. Atif Bhai i want to ask that i faced one fraud in gawadar.One developer sold me one file of 10 marla plot in white pearl city.it was onle file and he took 400000/- from me but even one year after he did not transfer this plot and he is not attending phone now.im living in lahore ,its very difficlt to persue him . You you forward your complaint to GDA. New Master Plan is coming soon. so please tell me what are those charges for and should we pay now? Ofcourse not a rich man , even 50000 are burden for us but if we must had to pay, we should pay and clear our plot from any charges. What you say all about these charges? These charges are imposed and being collected by all allottees at the time of letter collection. Till last update New Town was collecting it. If you have not collected your transfer letter then you have to pay these charges at the time of collection. 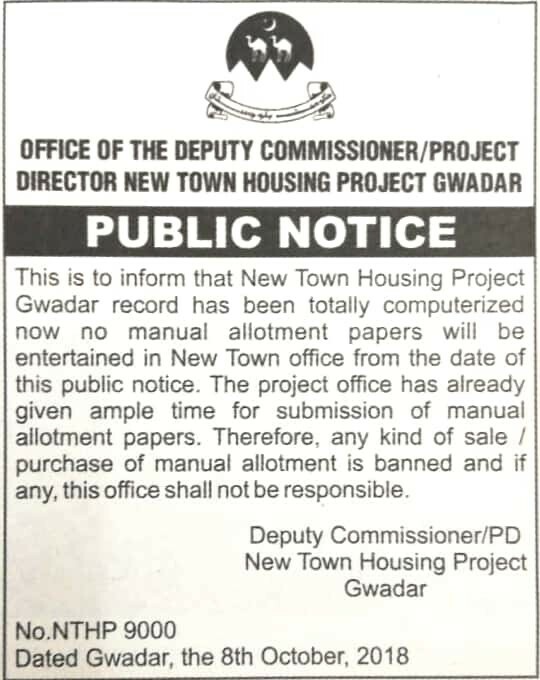 This is to inform you that New Town Housing Project Gwadar record has been totally computerized now, no manual allotment papers will be entertained in New Town office from the date of this public notice. The project has already given ample time for the submission of manual allotment papers. Therefore, any kind of sale / purchase of manual allotment is banned and if any, this office shall not be responsible. It’s seems you are praising or I might feel it decision of closing of transfer out side gawader. Can you please explain why this is good decision? If I want to sell I must had to go to gawader from Karachi. So did not you feel it creates more trouble for seller and buyer to must go to gawader? I think Seller and Buyer must visit Gwadar to see its potential and reality. Seeing is believing. In my opinion this show the real picture of Gwadar to investor. 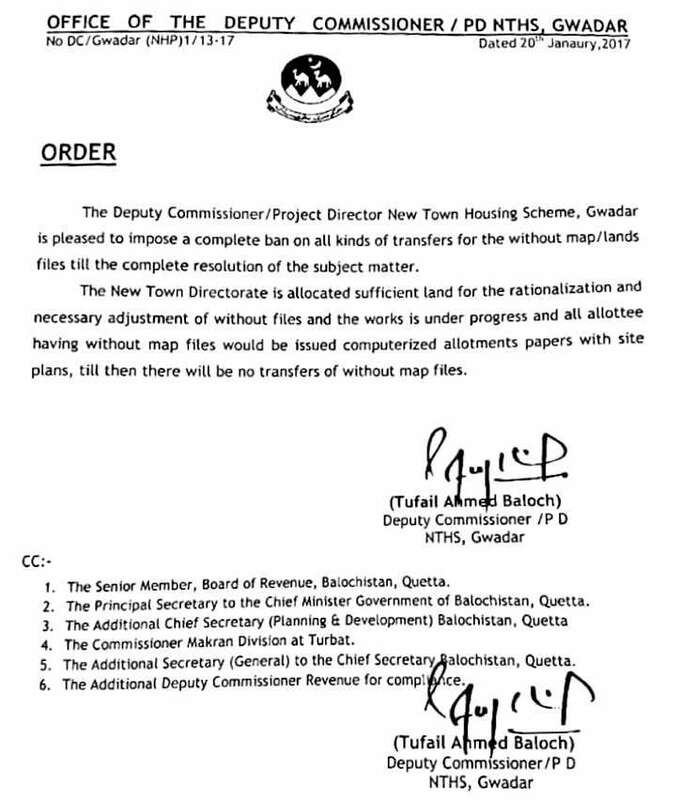 This is to inform you that as per Instructions by Deputy Commissioner / Project Director Gwadar, (special thank to CM Balochistan Mr. Jam Kamal) the transfer of New Town Scheme Gwadar will only be held in Gwadar office. 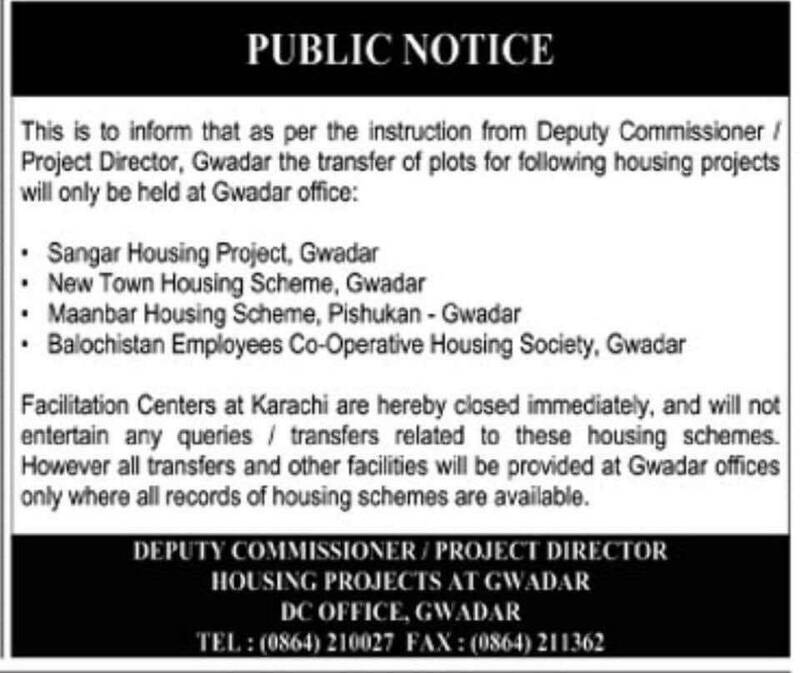 All facilitation offices outside Gwadar are hereby close immediately, and will not entertain any queries / transfers related to New Town Scheme Gwadar. Atif Bhai, You had shared a valuable piece of information. In my view people are more interesting to see the full map that includes phase 4 extension and phase 5 of New Town. Can you please share the informations that when will it come to market? It is expected after Gwadar Master Plan. Thanks dear Atif bhai for reply. Any new time frame about Gwadar master plan arrival. As planning comission of Pakistan’s mentioned date i.e. august 2018 had passed. There is no official date available for Gwadar New Master Plan, however there are rumors in market for November 2018. Is these plots are with or without map? did we must had to go to gawader in order to sell it or we can do formalities from Karachi. I heard there is office in Karahi too not sure we can fullfull selling formalities using that. You can proceed selling process in New Town Karachi Offcie. Our representative in Karachi only handle token collection and issuance of receipt etc. Also can you please suggest when is phaze 5 map is expected to annouced? and how much rates we expect rise after that? New Town Phase 5 Map is expected after Gwadar New Master Plan. There is no official date available yet. Prices will be depending on many factors. One of the major factor will be location of Phase 5. This is the top and best discussion i found on net about gwader property , responsive and honest people. and i really appreciate you people time and efforts on this. I need your opinion on one thing. I have a plot in gwader phaze 5 ,200 yard , computerized file but without map. so what is approx prize and did you deal in it in Karachi if we want to sell? what if i sell gwader plot and put some more moeny which i hardly collected ofcourse not a rich man so will it worth leaving gwader and coming to bahria. if so if you people deal in both gwader and bahri town karachi and if you have any office in karachi where we can meet. We only deals with DHA Lahore, Multan, Gujranwala, Bahawalpur, Peshawar, Quetta and others projects in Gwadar. We can assist you regarding New Town for buying and selling. We have office in Lahore and Gwadar. However we have representative in Karachi also. Please be careful while investing in Bahria Karachi. I am suffering having plot in p44. Bahria don’t have land from precinct 41 to 45. Assalamualaikum. 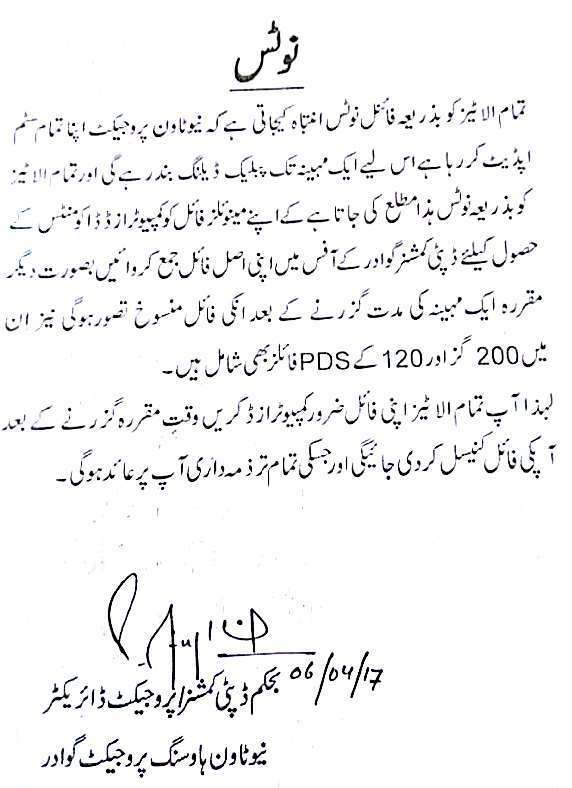 Mr. Waqar price of 120 and 200 square feet plot includea charges too?? It will depend on New Town Phase 5 location. Which is not officially announced by New Tow yet. But definite prices will increase in overall Gwadar market. However after New Master plan there will be number of new projects announced which are just waiting for master plan. People will have many new options available in market. Rest location of Phase 5 will decide its importance and the layout plan. If the road sizes are like New Town old phases as 20 feet in Phase 1. That will not favorable for New Town Phase 5. Despite all factors New Town is most tradable area in Gwadar so prices will have positive trend after New Master Plan. New Town Phase 4 is part of current New Town available map. But some of area of proper phase 4 is also under litigation. Where as Phase 4 Ext. and Phase 5 are without map and location is officially unknown. H32. Phase 4 Newtown 2 kanal Residential price ? This block is under dispute. I am not updated with its rate. Atif bhai,do you think that it is a good time to invest in new town phase 5?or should I wait? Prices are almost stable from last few months. Downside risk is low now. But Gwadar is not a short term project. You may invest for next 3 to 5 years holding time. how much price will go up or down for new town phases 4,5 after the release of gwadar master plan? Prices will take reasonable gain after New Master Plan. It will not only for New Town but also for Gwadar Property Market, but we must keep in mind that Gwadar is not a short term project for months of few years, it is a mega project and will take time for developments. Thanks Atif bhai. for detailed and well explanatory answer. It is approx area where it can be located. Investment in Gwadar is high risk high reward. You can go for Gwadar investment for minimum 3 to 5 years holding time. In Rs. 25 lacs you will not find any good investment in Lahore. Thanks Atif bhai,is investment in Government schemes like New town phase 5 also risky? By name it is Govt. Project and should be no risk at all. Until new Govt. formulation market may remain slow. We are also waiting for Gwadar Master Plan which may take next few month more. I think you should for next 3 to 5 years to get an optimum return. Believe me it is very low budget investment. If you can hold for next 3 to 5 years it is recommended. However if mean while it achieve your target you may sell it. Jazakallah for ur quick response. I would like ur advice in the following case. If I have 20 lakh in hand what should i do ? 2- Invest in 2 or 3 residential plots in New town? Maanbar is a long term project, it is better to buy near Gwadar City projects. We are not running any whatsapp group at the moment. We have active Telegram group for updates. Atif bhai i have heard that the new town phase 5 will get the map in august 2018. and prices will immediately go double. Is this true? The same happened with other phases too? There is no official date available for Map of New Town Phase 5. How ever prices will take gain once map is out. I would like to ask that do u have any news regarding Maanbar Housing scheme? When will transfer open? What are the transfer charges? Yesteday , one of my relative visitied gawader development office and he is saying that Gawader Development Authority is now demainding Rs 50000 Fifty Thousand for 200 yeards file as a Regulatory Fees. Can you please tell me What is Regulatory Fees and Does it make worth paying it. We already pay trasfer fee during getting computerize file in phaee 5 new town, not sure what is that regulatory fee for? Recently New Town imposed these new charges name as Regulatory Fees. Deal Associations Gwadar requested to all allottees to not to pay any such kind of regulatory fee until they solve this issue. They are in process to ask New Town to revert this Regulatory Fee. They have met with DC Gwadar in this regard. As soon as we have any update regarding this Regulatory fee we will update here. New Town Phase 5 Transfer is now open. You can get transfer in Gwadar and Karachi office as well. You need to pay one development installment to get transfer plus transfer fee. Regulation fee is being charged by New Town at the time of transfer letter collection Rs. 25,000 for 120 Yards and Rs. 50,000 for 200 Yards. I heard that map of new town phase 5 has been published. Is this correct news. If you know location of phase 5. Please share as I am willing to buy plot in phase 5. What should be best choice. A proffesional advice is highly appreciated. I better recommend you to hold Gwadar Property, its gain will be much more then any other city of Pakistan in coming years. New Town recently imposed some new charges, I am not updated with these details. Please contact New Town office for further assistance. Sir, What are the DC Charges for New town Phase 4/5 and what are the Transfer fee ? Only secure way visit with original file in person at New Town Office Gwadar. Rest all options are risky. Without original file it is not possible to check that if it is scanned copy / duplicate or else. So you are requested to make your self safe and sound follow the above recommendation. I would like to inquire about the New Town Phase 5 project. Have the maps been issued? Also if you could guide me about the new Oil City Project. Is it a genuine project or is it another rumor ? I have been approached by a property dealer in Pakistan who promises to get me 1 Acre of Land for 320,000 Rs. Is it authentic ? I would be really grateful for your guidance. New Town Phase 5 Map is not out yet, but as per rumors it will be soon. However no definition of word soon here. For Oil City or any other project authenticity we need to wait till new master plan, which is expected in August 2018 as per media news. As per rumors in market Oil City will consist of 100,000 Acres or 70,000 Acres area as per media news. Atif bhai,any idea when file transfer will be open? I am interested in newtown phase 5. Do you think it is worth investing? There is no official date available with me for opening of transfer till last update. It is worth investing if you can get transfer on your name or you are buying from a very reliable source who is committing transfer in any case. There are strong rumors in market for Phase 5 without map files of 120 Yards and 200 Yards. But there is no confirm date available yet. We are also hope full about it. People started asking higher prices. Market rumors are from 15 March New Town will start giving previously submitted files since last 6 to 12 months. Once the supply will be available in the market, this may result a downward trend in the market if other factors remain the same. I think you have manual files and yet not computerized. You are requested to contact New Town Office for further assistance. 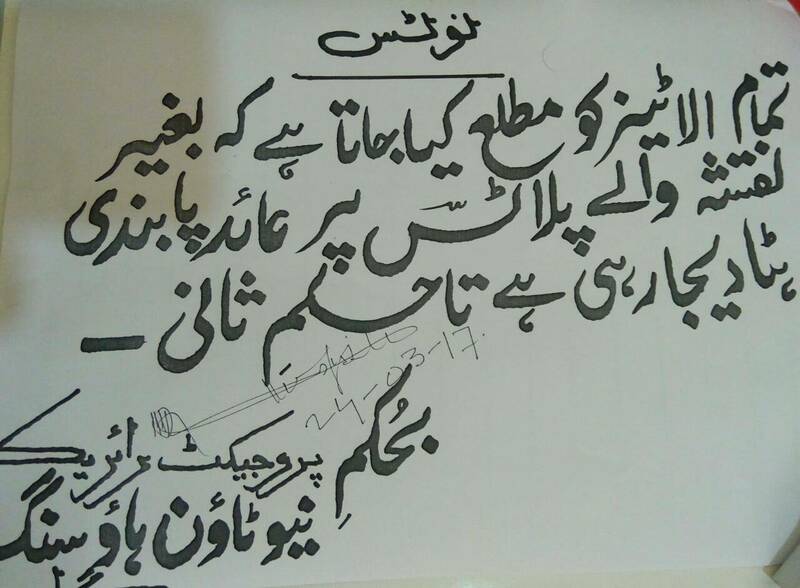 Thanks Atif Iqbal bhai, is there any possibility to make file computerised & approximate charges pl. You need to contact New Town office for any possibility (if any). Yes there are computerized charges, it vary as per size. Please contact New Town office directly. We are working on rates and will be updated soon. Kindly share your learning about Gwadar’s Stability. It is a serious issue regarding New Town that after 1 year you are not able to get the transfer letter. We are not dealing with these non map files due this reason. You need to hold it till issue resolved. It is not recommended for investment till transfer open. Currently it is not transfer able. Aslamu alikum atif bhai can you please tell which schemes or areas of gwadar have high rise commercial plots? only marine drive ? how about high rise in new town and private societies (golden palm, canadian city etc)? Atif bhai,where can I invest in gwadar with the budget of 10 to 15 lac only? Atif bhai,Has the transfer been open for new town phase 5?Do you recommend to buy in phase 5 or phase 4 extension at this moment? Transfer is not open yet. We will update New Town rates soon. We are waiting for transfer to be open, then we will think about it. I bought a plot in phase 2 new town 500 sq yards in January this year. havent receive transfer letter still and only have receiving. Please guide what could be the issue. And is anyone else facing this? New Town office is now open for public dealing. I am sure your letter is ready as you apply for transfer in January. Please contact New Town office for further assistance. I bought New town phase 5 without map file for 200 yards plot few months ago but now seller NIC is expired. Is there any problems during transfer. There is no confirm date by New Town for opening of transfer. Maanber transfer is also not open, please wait till transfer open. We will start trading of Maanbar Scheme once transfer will be open. I need info about road cutting plots in new town. I have submitted my documents in dc office and can I get a revised map of newtown. My plot is in road cutting in new town. I have submitted the documents in dc office gwadar. Will they going to give me a better location and I also need a new town revised map. Map is not available in the market, you may request in DC Office for revised map. Can you please tell me your actual plot number. Every one has different opinion of secure and safe investment. I better recommend you to first of all visit Gwadar your self and then wait for new master plan and once things settled then enter into the market. Only GDA can tell when master plan is coming, it is always suggested to verify plot from society office before doing any token or deal if agent is not trusted. atif bhai new town phase 5 may 120 & 200 yardz k kya rates hain? 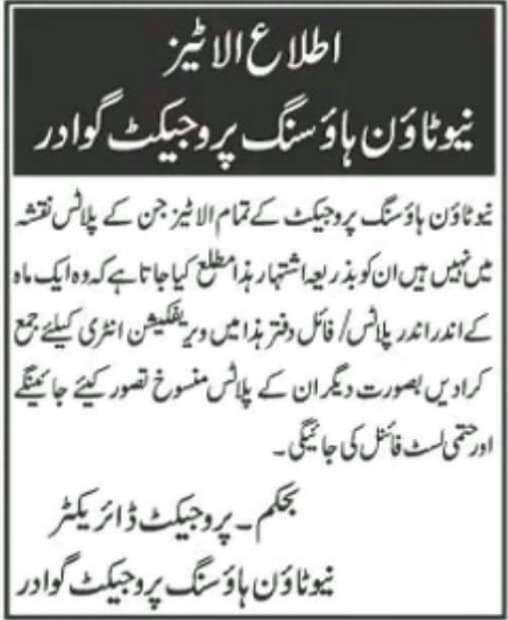 agr gawadar ka master plan change hota hy to new town phase 5 py kya effect ho ga? At the moment transfer is not open for New Town, please wait till transfer open. However it is recommended to wait till new master plan. When the master plan is coming and how it will affect price of phase 5 and 4 extension. Will the files of 200 and 400 sq yd will be included in the map. Do you think that prices of without map files will further decrease. New Town transfer is not open at the moment. Every thing can be possible. Only New Town can tell 200 and 400 Sq yards will be included on not. Prices for without map files may come down and up in short term. I have purchase 5 Marla Newtown phase 5 file from a dealer. After 4 months still not got allotment letter. I just have only receiving of transfer documents issued by Newtown office. Plz tell me how can I verify my file and do u have any contact numbers of Newtown office. mentioned rates for new town includes development charges or not? if not how much are charges and when to pay, and does master plan revision will effect new town or any other housing society? Indicative rates are without development charges. At the moment all New Town transfers are closed, it was closed on 6th of April for one month. I assume it will be open between 5 to 10 May. All public dealing will be closed for Manual Files for one month to convert all manual files to computerized files. All kinds of verification and transfers are closed by New Town for 1 month. You may verify the plot after one month. 2 Kanal (1000 Yards) Marine Drive Facing Sea 900 to 1000 lacs Before Sarawan Avenue. New Town Management issued notice for opening of transfer for non map files in New Town Phase 4 Extension for 400 Yards and 600 yards & New Town Phase 5 for 120 yards and 200 yards. sIR – WHERE IS THIS notice. Please share more details. Atif bhoy I want to sell my New town phase 5 200 yards plot file . What is current price? Sellers are demanding 15 lacs for 200 yards file. But due to transfer is not open we are not trading it till transfer is open. I have heard that transfer is open now. If it is so then what will be its impact on prices. Previously it was not required. But what will be future policy when transfer open we are not sure about it. Builder / developers / authorities can change their policy for transfer procedures any time. 2.4 Kanal (1111 Yards) Marine Drive Facing Sea 1200 to 1400 lacs Before Sarawan Avenue. Sir How do I transfer the Phase 5 Newtown file to my name? In shorter run market always can go up as well as down. It current state of market it is more expected to come down in not now but after some time, it is really hard to find the last highest point from where market will come down. For example if current market of 120 yards is 11.50 lacs and market continue to grow and reach up to 20 lacs and then get back so it may not touch 11.50 bottom again and come down and stay up to 15 lacs. So we will say that market get dropped but it will not touch your current price. Gwadar market is going very in predictable from last two months. These prices are not definite real prices and there is a hype in market due to buying patron in market. But if prices not dropped in next 2 to 3 month then market may grow more. Gwadar is now at growing stage in longer run it will continue to grow but in shorter run it may also go up and come down for mean while. I will not recommend to put your life time savings in Gwadar or any other project other then DHA. Gwadar is a risky market you can take risk with some spare amount if you have any. Adnan bhoy pls give your feedback about China village scheme as announced by Alasal group. Is this safe for investment.? We are not dealing with China Village at the moment. Is there any chance of cancellation of any phase of New Town due to New Master Plan of Gwadar? Only GDA has such information. Please contact GDA for any further assistance. It is normal practice of New Town they give letter from 3 to 6 months. Its better to contact Mr. Waqar at this number +923239581357. In Gwadar often net dont work. He will not be to give your immediate response. Or please provide me your contact # so Waqar can contact you. New Town Phase 4 1000 yards residential plot price vary between 15 to 110 lacs depend on location block road size etc. Hope fully you can easily analyze it. Is it good to invest in Industrial Property or Residential/ Commercial Property in Gwadar at this time? Or one should buy an open land? Its better to invest in Govt. Schemes at the moment like Sangar, New Town and Gwadar Industrial Estate. ASSLAM O Alaikum, ATIF Bhai G New Town Commercial 222 Corner Plot Kh Assessment Please Required Ha,Ap Mujh Kh Bhai Kh Lea New Town Phase 5 Mh 200 Sq Yd Kh Request Ke Thhe, Bhai Adnan Nh Batlia Nhi Plz. Atif& Adnan Bhai Favour Denh Chotti,investment Se Confidence Barhe,Ga! Sellers are now demanding 250 lacs for 222 yards. Market is very un certain for prices. Prices are shooting up. Due to this there is hardly a trade in market on these rates. salaam i am not in pakistan how can i buy the file? You can buy plot in New Town, buyer presence is not required at the moment as per New Town policy. Please contact Mr. Adnan for buying plots at best prices in New Town Gwadar. what are updated rates of singhar housing scheme and new town housing scheme. I am very hopeful about it. Kindly mention plot number for assessment. It mean that New Town have enough land to accommodate these files. Now there should be no doubt of having land or not for non map files. These all are just market rumors. 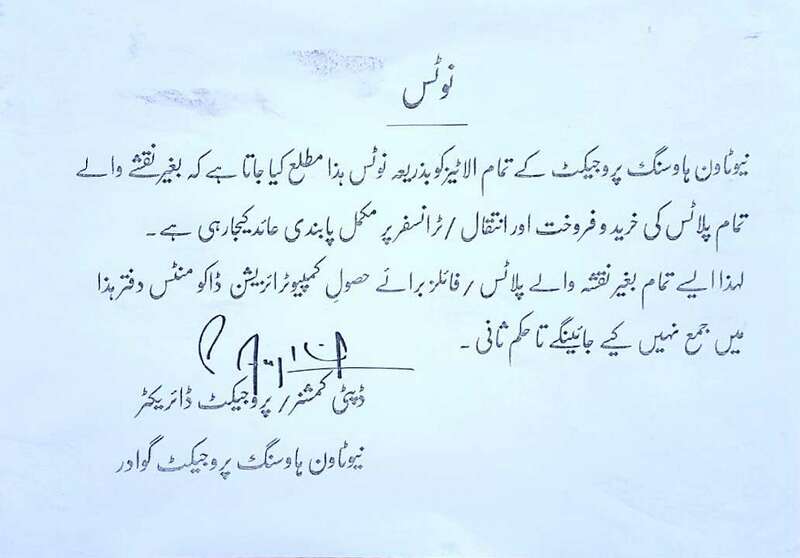 Now this is official circular issued by DC office. However due to no transfer purchase demand may slow. Available option in Phase 2 are :B130 second to corner @ 28 lacs & B148 cornor plot @ 32 …. Thank you for your response Adnan. This is what customer want to see. Do you recommend it for investment? Shukriyya for visiting our web. Investment in 120 yar new town Phase 5 is minimum investment.Yes i recommend for investment.Cash money is devalue day by day but through investment you can increase cash value through investment…. Adnan thx for prompt reply plz also mention 120 yards total transfer fee. what is 5 Marla (120 Yards) today’s price. where is new town phase 4 and 5 in the map? We have no idea about map launch. Only New Town can confirm it. You may contact New Town directly for further assistance regarding map. Usually Nerw Town take months to issue the letter. I have few cases in notice that been transferred in March 2016 and still waiting for letter. Where Can I get all this details I’m looking for some good option. Please let me know what kind of information you ate looking for? I’m interested New Town Phase 5 Residential 16 Marla (400 Yards) Plot. What is it’s current rate. What is the current price for Phase 5 16 Marla residential plot. There are rumors in market about it. People are also protesting against this. But there is no official statement available regarding this from New Town. So I am unable to make any comments on this issue. You must contact New Town directly for any further clearance. We have given New Town number on this page. Without map files are gaining and prices will be out of reach soon. New Town latest rates will be updated soon. Congratulation, I do recommend to sell this file. I have heard that if map is issued it’s price will be doubled. Is it worth to hold for six more months. I don’t have immediate requirement of money. It is highly recommended to hold it. Atif bhoy What is the development installment? If I want to pay full development charges then what is the rate. Dear Atif Sir, I want to purchase New Town phase 4 commercial (Without Map). i heared its cheap but there is some issue of transfer, that governoment has close Transfer (i dont know for what reason). Can you explain plz, should i buy or not ? and what about transfer? Yout can get transfer without your presence. Transfer is now open for New Town Phase 4 and Phase 5 without map files. We will try our best to uodated the New Town map as released. Without map files rate are much lower then files with plot numbers and map. All verified files will be included in the map. New Town recently opened verification and ask Allottees to verify their files. I have some questions regarding Gawadar Projects. if you can rply, i will be greatfull of you. 1-What is the status of Commercial (Computerized but NON-MAP) file 500yrd of phase 4. LOCATION, Price & Future ? I heared Phase 4 map will be changed ? 4-Which is best & safe for 3 years Commercial investment, Sangar , New Town or Gawadar Industrial Estate in 40 Lakh Budget. 5-if you can make the camparision btw old & new prices of few areas for example, it will be a great favour for people visiting this page to get an idea how Gawadar Market is working. I request for detail one by one answer of above questions, and if i am forgetting something, plz add . I was unoble to check the sites from last 3 week. I am busy with Gwadar Office renovation. Now it is near completion but still may take a week or more. I will reply all your questions one by one soon. Very nice Job you are doing. Really worth full website. Please tell me what is the location of New Town Phase 5 as it is not shown in map. When New Town Phase 5 will be developed and ready for construction. It is worthy to buy New Town Phase 5 plots? Thank for your valued feed back. At the moment no official location marked by New Town Gwadar for Phase 5. In our last meeting with Project Director, he told us that we have been granted 900 acre from Govt. for New Town Phase 5 Gwadar and it will be hope fully next to New Town Phase 4. He said that we have now open verification of manual files once it is completed. We will released map for New Town Phase 5. Definite development will take next 3 to 4 years as expected. Yes it is worth full to buy any thing in Gwadar but after proper verification. 6- On transfer day our representative will present himself in New Town office on your behalf and proceed the transfer. If it is New Town then good news is that New Town has open the transfer. You can get transfer files without your presence in Gwadar. If you need assistance for transfer in New Town let me know please. What is the location of phase 5 in New town? i am assuming these are files so is there an estimated ballot date/year? As per discussion with New Town management, they are saying that New Town Phase 5 location will be next to Secretariat. For ballot date and development related quires please contact New Town office directly. Mr. Atif Iqbal, I have plot 1000sq yd G176 cat A. How much can I get for it if I want to sell it? how much would be a 16 Marla commercial plot (in New Town Phase IV – Plot – for example B-20 would be of in Rs) ? can you tell me how much would be the commercial plot would be worth ? I purchased a 500sq yd plot in New Town Housing Project Gwadar in 2003. I only have Sale deed and an Allotment order on MCB letter head signed by DC Gwadar and one بیع نامہ stamped by Tehsildar Gwadar. How can I proceed to now track down the plot and get its allotment so I can sell it? You must visit New Town Office in Gwadar to complete process. I came back from Gwadar on last Sunday. I met director land New Town Mr. Abdur Razaq and have detailed discussion with him regarding New Town Phase 5 Map and it’s development and also opening of transfer. He told me that they recently advertised in paper for the verification of plots who’s are not on map. Once the verification will be completed they will issue the new map including New Town Phase 4 remaining plots and New Town Phase 5 Map. Once map will be issued they will open transfer. Allottees are requested to verify their files within one month. I will upload ad here also. Dear atif bahi thanks for important updates. It is good news. I have got receipts of my 2 plots directly from new town office for submission of my transfer documents including seller stamp and I’D card ; his pics etc. So does it still require verification from office. Also kindly update can I sell my 400 yd file and in how much price? What is the price as I want to buy 200 yards file in Newtown phase 5 without map. Thanks but one of broker asking 5 lakh for 200 yards phase 5 file as he said map will be available soon. salam atif bhai. i am an overseas pakistani and want to make a small investment in gawadar . please advise me. thanks. Would you please mention the minimum budget amount so I can assist you with best of my knowledge.